Stress, Trauma, Adjustment, Adaptation and Resilience — Your first step to success. Does a rock feel stressed? Nope. It sits there, accepts the wear and tear, rolls with the flow of water and time and always serves as a shelter or a support for some thing else….oh to one inorganic is to have peace. I am from Iran. My cultural context for stress is very different than what I confronted when I came to the United States back in 1977. I grew up with significant poverty, political and social insecurity and a number of other experiences in my life that I later learned, in the United States, are called trauma. There are words for injury, harm, a “hit” to, etc that are used to convey damage to either one’s physical or psychological well being but trauma is not a direct translation. Those terms do apply to negative experiences that significantly impact and damage a person but there is also an expectation of resilience and moving on. Growing up in that culture I saw struggles, hunger, violence, discrimination, disasters and other events and experiences, which we consider traumatic here in the U.S., as part and parcel of life. It was expected that one’s life will be intertwined with many, many bad experiences and, therefore, while the experiences were surely unpleasant and left physical and psychological scars, not moving forward was not an option. Before we go any further I want to make it clear that I saw clinical depression, suicide and all manners of mental illness which would resemble their counterparts in the United States. In fact I started studying psychology with my first book on psychiatry written by a western doctor at around age 12 and could easily relate the content or symptoms to those I saw in my community. So it was not the human condition that was all that different, it was the mindset about life that was different. I observed and analyzed carefully how the community responded to a person who had been injured in some way and, without making too broad a generalization, I discovered a pattern to the approach of that response. First, empathy usually impeded in a facial expression of sympathetic pain, followed by several phrases that conveyed that sympathy that translate—loosely—to “oh poor baby” then followed by “my dear, what did you expect” to “its Ok, don’t even think about it, everything will be Ok” followed by “thank goodness____________(a more severe problem) did not happen to you.” Usually the end of this conversation/interaction involves an action: either getting up and doing something positive, eating something sweet, or generally moving on with the functional aspects of life that distract and focus the mind and body on the here-and-now. This approach, and its different phases, would take longer depending on the problem presented or may recur if the pain persisted because of its magnitude but it was the same over and again. I am going to simplify the idea of stress so we can understand its fundamentals. But that does not mean stress is simple. 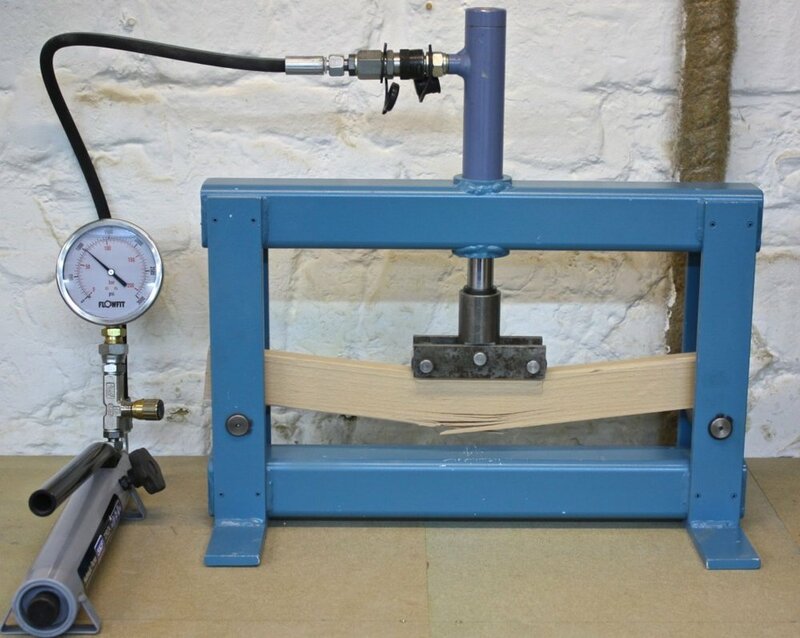 In the picture above you see a material stress testing machine: A piece of material is placed in a fixed position, pressure is applied and measured, at the pressure point at which the material fails to hold its structural integrity is the stress tolerance factor. Now, let’s imagine you are the material being tested and life is the hydraulic press—in the picture above, you are the piece of wood. Regular pressures of functioning place a certain amount of pressure on you but as long as you keep you structurally intact and as long as life pressure don’t exceed your ability to tolerate them. And you can imagine that a healthy piece of wood right out of the drying kiln is able to tolerate more pressure than a rotted, distressed and deteriorated piece. I know what you are thinking. Easier said than done. And to a certain extent you are right. We often can’t control what life throws at us. You have to have housing, eat, pay for utilities and education, healthcare, etc. etc. To do so you have to work and unless you have really marketable skills finding a job that pays all the bills is not easy. Then, if you have children, or older parents that you have to take care of, you have even more stress. There are 24 hours in the day and 48 hours of things to do just to manage obligations. I get it. Been there, still am there. Spread life commitments over a longer period of time: If all the pressure is applied to a single point of the wood in the picture, it will crack sooner but if the same pressure is applied to the entirety of the length of the wood it will not have as much of an effect. Time is your length. Spread obligations over a longer period of time so their time-point pressure is less stressful and more manageable. In the picture you see wood being tested. The material integrity of the wood depends on several things: the species of wood, the health of the wood, and how flexible it is. Flexible wood bends but does not crack as quickly as a dried piece of wood. So flexibility is very important in stress tolerance. We will talk about developing flexibility later. Improve its internal structural strength: That is, supplement it internally to make it stronger. Maybe drill holes and insert steel rods in there or treat it with chemicals that make it more resilient and less susceptible to rot. Applying this analogy to us means you have to improve yourself from within. Taking care of your body, exercising, engaging in mental activities that take you away from daily stress even if for 5 minutes every 3-4 hours, not facilitating your own deterioration with excessive alcohol use or smoking or eating poorly. Build yourself up and maintain yourself as best as you can so that you CAN tolerate inevitable stresses. And, don’t forget education. Learning and creativity are some of the best tools you have to improve your internal capacities and strength. Knowledge gives you options, it gives you perspective and it provides you multiple pathways to anticipate, solve and/or bypass problems. Finally, learn flexibility. Believe it or not acceptance of the inevitability of stress is not nihilism, it is preventing shock. If you expect things could go wrong, you are better prepared to handle them. Building flexibility also involves being a mental gymnast. Here’s the mantra I suggest; Things can and will go wrong, when they do I will not like it at all, and I will find a way to deal with them in time. Support and strengthen with stronger material externally. Wrapping wood in a cage of steel, encase it in concrete, etc. To strengthen yourself externally involves surrounding yourself with human resources who love and support you. When we are stressed, we have a tendency to withdraw and create excuses like not having time to talk to others or reach out to loved ones. In truth we don’t reach out because we feel like we are failing at life and since we have nothing to brag about we don't want to add to our own misery by recounting our life’s circumstances and our own inability to meet its demands. However, this is a very counter-productive strategy. By telling people what is happening in your life you will find two kinds of reactions: Empathetic people will accept you, reassure you, communicate their belief in your ability to deal with life and share their own shortcomings. Keep these people in your life. Then there are those who won’t wait for you to finish your sentence before launching into a diatribe about either how wonderful their life is or how much more important their misery is than yours. Drop these people from your life. You do not need 35 friends. You need 3-5 good people capable of handling your emotions without taking over your life. Professional help is also critical. You can’t know everything. You need doctors, lawyers, accountants and builders. Find professionals you trust and keep them on your phone contact list. I realize they cost money to use but the alternative is usually costlier. I speak from personal experience. Where the analogy of you being either a piece of concrete or wood fails in our material stress machine is very significant. Unlike a wood or concrete you are dynamic. You are not a passive recipient of life stresses. You have an internal spring that energizes you and that is why you can fight gravity every day. So life stresses work on you but the more life force you have the less they can press you down. In the diagram below you see a computer keyboard mechanism. The key sits atop a curved flexible piece of plastic or metal that acts as a spring and places pressure on the key to hold it up. The keyboard cover plate stops it from popping off. So this button is already pressed. To disengage it you have to press it down or de-press it (to counter the internal pressure). That is why in so many manuals they don’t say press the button the day depress the button. In the second image below you see a depressed button. Applying this analogy to us means we are the button, the life force we have is the internal spring and life’s forces are what “depress” us. The keyboard case is our support system. It is the things and people that keep us from giving into our internal forces and acting out. Its societal and moral limits. And there is a perpetual and dynamic interaction between life pressing us down and us pressing back which results in the writing of our life’s story. When the pressures from above are beyond our capacity for a long period of time, it wears down our internal spring. We become quite literally, well, depressed. If that life force within is weakened, or is inflexible it will crack and the button will not come back up over and over again to counter life’s external forces and stresses. Thanks for reading, I hope this information is helpful. In my next blog we will talk about adaptation and adjustment strategies.